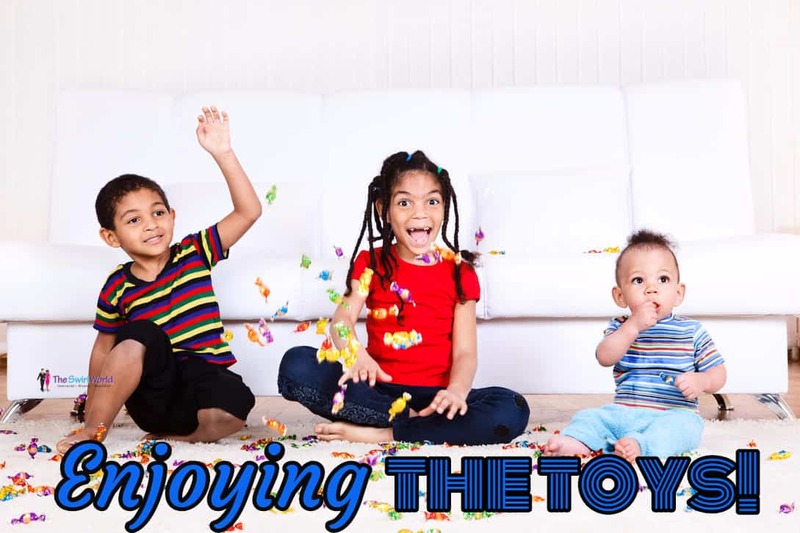 It’s the day after Christmas – are you/your kids enjoying the toys? Join in the Fray: Hopefully you’re enjoying a sunshine-y day. What are you up to? Purpose is a very common word these days, but its overuse doesn’t make it less valid a term. I believe that when we find our purpose or our “why” as I call it, we find who we truly are. It is common to hear young adults say they are “finding themselves” right around the college years when they have no idea what they want to do. Or, in my opinion, are afraid to do what they know they were born to do. It’s a beautiful, scary, gut-wrenching thing. But, it is the call of our future, amazing selves asking us to choose us right now. Did that make sense? Let me tell you what Webster says. Per Merriam-Webster, purpose is “the aim or goal of a person: what a person is trying to do, become, etc.” So, what are you trying to become? What is your aim? Do you know it? In my new book Do It Anyway! The Single Moms Guide to Living Life and Achieving Her Goals, I discuss finding your why. See, it is my belief that we are half way living if we never answer that all-important question about why we are here and what we are here to do. I’m a single mom to two teen boys and I love them dearly. But! They are only part of my purpose. They have been entrusted to me for a season and then they will be grown and on to pursuing their God-given purpose. Where does that leave me? Right. Which is precisely why you and I must pursue our purpose with children. Tell me. What has life or as I believe, what has God called you to do? Don’t worry. Not everyone can be a pastor of a church, but we all have a call to rise higher. Whatever it is, say yes! Yes to you and your dreams. Wake them up! It’s time to Do It Anyway! Read on for an excerpt of Kaywanda’s new book, on pre-sale now! It’s amazing to see women who undervalue what it is they do. I am always amazed at my girlfriends who tell me they don’t have a talent. We single handedly make the world go round for our families, yet they, these strong women, think they do not have what it takes to be more, to do greater. They think they are regular. In their own words, they are talentless. What they really mean is they do not fully own all that they possess and for some reason they do not know what it is that makes them live. By live, I mean that thing that pushes their soul to sheer and complete happiness. That thing that drives them to wake up and chase their dreams, that “je ne se quoi” that only they possess, they simply do not know what it is. Or, they don’t have the courage to admit it. I think that these women, and you may be one, have lost their “it”, their “thing”, their “mojo” that God innately placed in them. 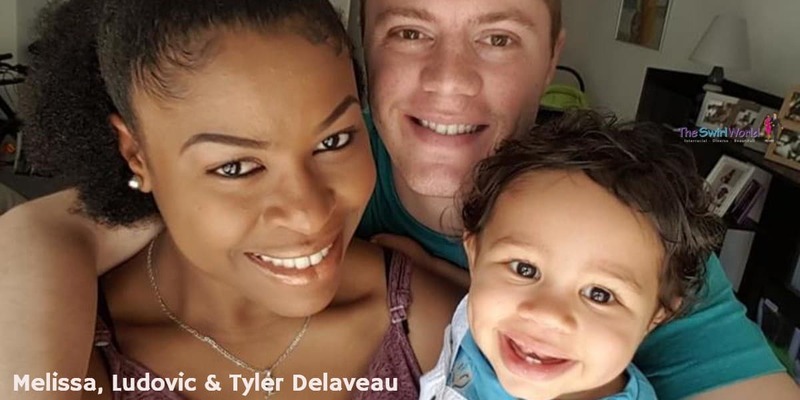 There is nothing wrong with devoting yourself to your family. In fact, it is quite common for new moms to let go of who they are to become a “we”. It’s exciting to be married, in a relationship, and to have a new baby is exhilarating. And then, we go all in. This is the part where we all mess up (Yes, I also did this). The problem is we begin to neglect ourselves for the benefit of US. It is your staying lodged in we that you begin to lose “I”. Make no mistake about it. There is an “I” in fam-i-ly. I know you have good intentions. So did I. But, there comes a time when you are going to want to pick up those dreams of being a doctor, saving children, helping the elderly, and cute cuddly baby will no longer suffice. Hear me. I am not saying that you love your family any less. I am saying that your hunger for what you were born to do will grow. You will figure out how to answer the call or you will stifle it. Trust me. You can do both. You can be a great mom and a dream chaser! We all have talents, gifts, and resources to give away to our family, friends, and the world. We all have a unique voice that must be shared. When I say voice, I mean your specific way to express who you are. You have to find yours. Your kids are not the sum total of you. Let me say that again. Your kids are not the sum total of you. I know there are people who say we single parents should focus on our kids and let who we are simmer on the backburner. But listen, we have so many examples of single parents doing it today. There is no reason to think that you and I can’t be who we are parent well, also. I can hear you now. “But, I don’t have a special talent. I wasn’t made to be great.” Or, maybe you say this one, “I don’t know what my purpose is.” Sound familiar? I know it does because I was once in that very position. I know what it is to ask “Why am I here, Lord?” or “What is my talent?” The truth is we all come to some point where we want the answers to these questions. And rightly so! We know there is greater for us. We all secretly know how awesome we are and seek to show that awesomeness to the world. The question then becomes in what stage and how? When I was little, all my family (or at least it seemed like it) knew how to sing. I wanted to sing like them, but instead of using my own style and gifts, I mimicked the stronger altos. I was a mezzo-soprano and loved all things soprano. I loved ranges really. And unfortunately, I tried to be all of them instead of what I was. Subsequently, I ruined my voice and trained my throat that high notes should be left to Mariah Carey. So, the point is that we have to be ourselves and operate in our why. I can’t be you and you can’t be me. But, we can be powerful in our own ways. You may not feel it or even think you do, but we all have a purpose. We all have gifts on the inside that must be used for our good and the good of others around us. You just have to find out what that is for you. I call that finding your why. We have all seen people we want to emulate. They seem to have it all together and are experts at what they do whether that be connecting, serving, networking, speaking, etc. They are happy, fulfilled, and excited about what they are doing. They simply have zeroed in on their why. That is what I want for you and every woman I can touch. That, my friends, is my why. Let me tell you my truth. Having a family does not stop the burn in our hearts to achieve our dreams. I know. I felt guilty for wanting to do it all. And I have talked to enough women to know that guilt is there. Somehow if we work (and we need to as single moms), we feel guilty for not being the stay at home mom we dreamed we’d be. Or, at least I did. But, what I’m about to say may be totally opposite of what some folks will tell you. Just listen anyway. Being content raising your kids while putting you on the back burner sounds selfless and wonderful, but it will kill your joy, your spirit, and your zeal for life. Being a single mom is surely not what most of us thought we would be, yet we are. I want you to know that being a mom is a calling, a gift, a blessing, but life does not stop there. It does not stop because we became parents. It may be harder to do what we had originally planned, but it is not impossible. Hear me good. I am not saying choosing to focus solely on your kids is wrong. If that is for you, by all means do it. But, you will still yearn to complete your original goals. Yes, some women have been able to say good-bye to their dreams. But, I am not able to make peace with being a single mom that lives in the background of my children’s lives. And you do not have to be either! I’m too fabulous to lie dormant. And guess what! So are you. Somebody needs my gifts! And they need yours. You just have to find your why, develop the balls to chase it, and do it anyway! Yep! I said grow some kahunas. I mean are you really content with staying on the sidelines until they are 18? Nah, not me! We/re going to do this thing together. They are going to get the best mom who also rocks her dreams. Talk about leaving a legacy! The time to come out of the stagnant, can’t stay balanced with it all, overwhelmed state you are in…is now! It is time to truly live. An invigorated, happy you is an invigorated, happy family. Do you know what walking in your purpose really translates to for your kids? They get a happy mom. They get a mom who does not regret being where she is. 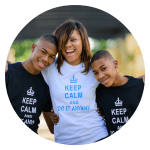 They get a mom who is showing them how to roll with life and come out a winner. Ah! No one has ever said it that way have they? Nope! But, that doesn’t make it less true. Choosing to not chase your dreams is hurting your kids more than you think. Let’s face it. I see far too many single moms complaining instead of celebrating. It’s rough. I agree. Been there. Bought the t-shirt and the mug. But, it is not impossible to do. Your kids are waiting on the real you to stand up. Will you give them you? Will you give the world you, your gifts, time, talent, and expertise? Now that you are a parent, has your why changed? 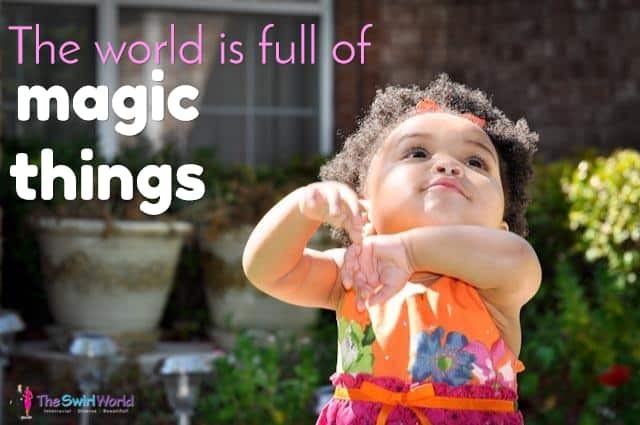 Do you still feel passionate about what you were doing or has having your babies opened you up to a whole new world of experiences? Hmm? It is time to find your next WHY. Hopefully the above rant got your mental juices flowing. See, I believe we all have purpose to fulfill and that as we move along sometimes that purpose changes. Think of it like this. You were a cheerleader in high school. Your purpose was to show other girls (who never got picked) how to make the team and share Jesus. Then you graduated and moved on to college. Now, you are not pursuing cheerleading, but you are sharing faith as a member of the Student Council because being a cheerleader helped you get rid of your shyness, gave you boldness and an in to speak to those who normally would not listen. Okay. Random story. But, do you see how purpose changed throughout life? And sometimes it is only in looking back that we can really see why things happened. It is my desire that you have more than been blessed by this article. It is scary but as you have read it is well worth it to chase your purpose. You and your family will thank you. 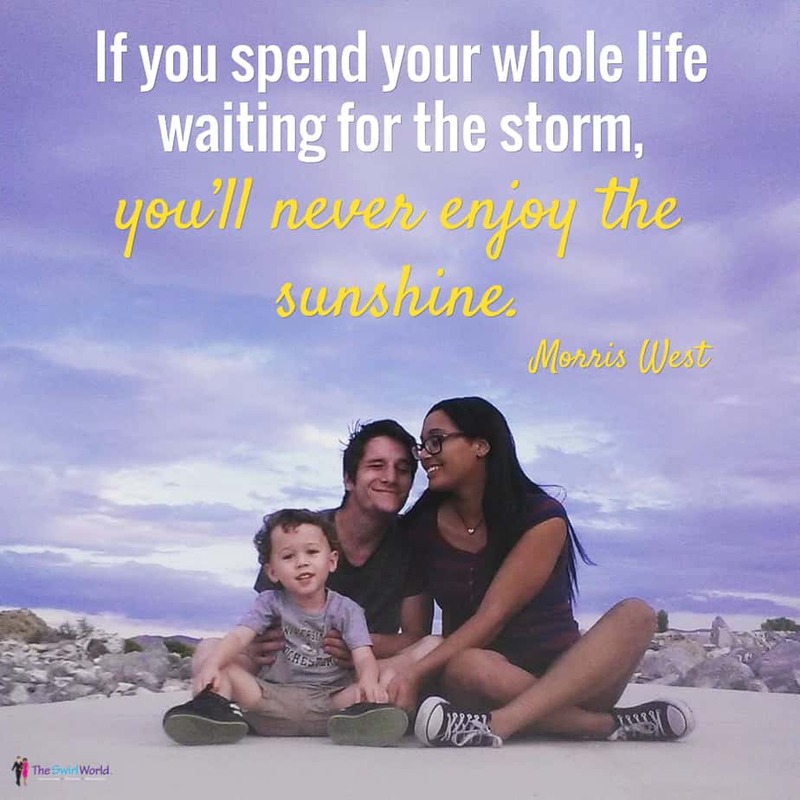 For more inspiration and tips on single parenting, come see me at KaywandaLamb.com. 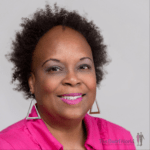 Kaywanda Lamb is an author, blogger, speaker, and Single Mom Coach. 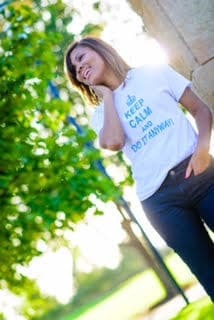 She teaches single moms to rock the life they got using her motto #DoItAnyway! And her 4 Part system. Her boys are her pride and joy. 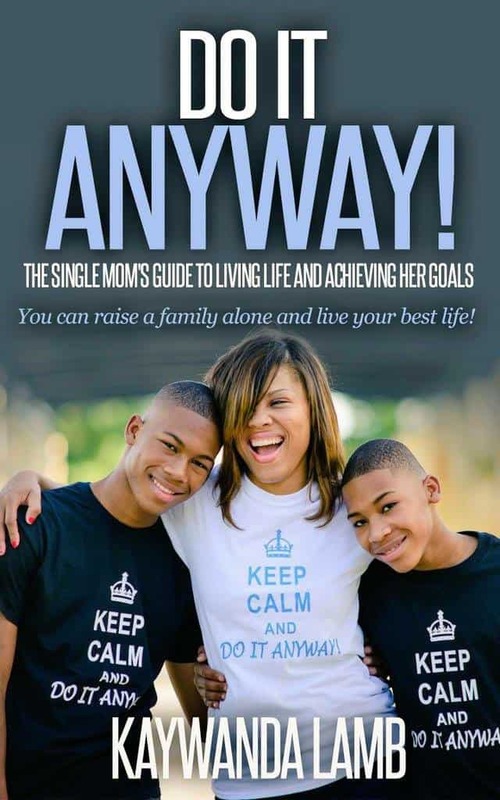 She is launching her first book Do It Anyway: The Single Moms Guide to Living Life and Achieving Her Goals September 2015. Follow her @Kaydyma on Twitter and at KaywandaLamb.com for more inspiration and a free discovery session. Note: The Swirl World receives no affiliate income from this post. We love Kaywanda and simply want to support her! Copyright ©2015 Michelle Matthews Calloway, ASwirlGirl™, The Swirl World™, The Swirl World Podcast™, The Swirl World Inspiration Daily™, Swirl Nation™, All rights reserved. Blog post and excerpt from Do It Anyway! The Single Moms Guide to Living Life and Achieving Her Goals Copyright ©2015 Kaywanda Lamb, All rights reserved. Photos, blog post and book excerpt used with permission. It’s not the load that breaks you down; it’s the way that you carry it. 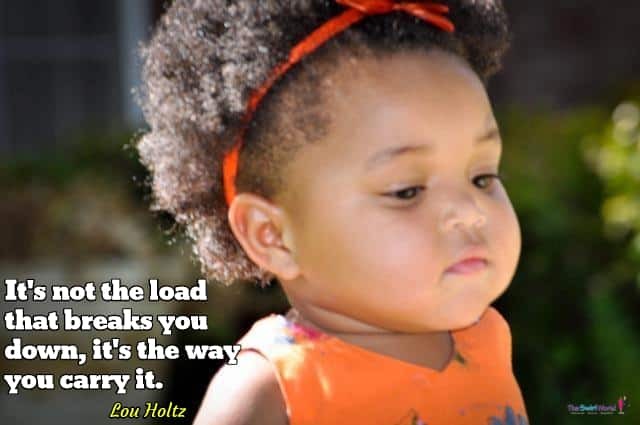 What kind of load are you carrying around today? I believe we each carry something, in one form or another. Yet, even the heaviest loads are bearable – if we carry them correctly. So don’t get carried away by the burdens of your life. The Serenity Prayer is helpful, especially if we practice it and apply it. Join in the Fray: What burden do you need to let go? Whether by blood or by affinity, family is everything. 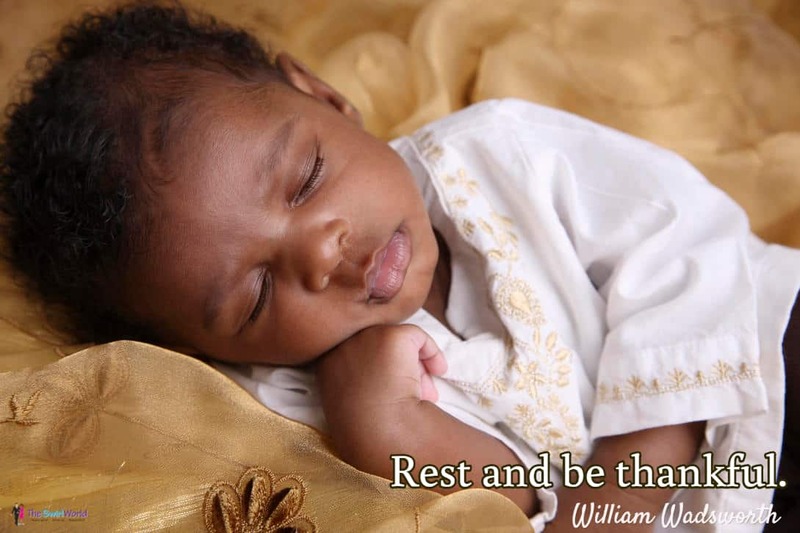 We trust you will have the opportunity to spend quality time with your family this weekend. And for those family members living in other places, thank goodness for Skype, Face Time, Google Hangouts – and good ole telephones! Join in the Fray: Which family member or friend will you spend time with (or contact) this weekend? Here on the blog we talk a lot about the benefits of travel. For me, this quote by Maya Angelou goes a long way toward highlighting the multiple benefits of travel. 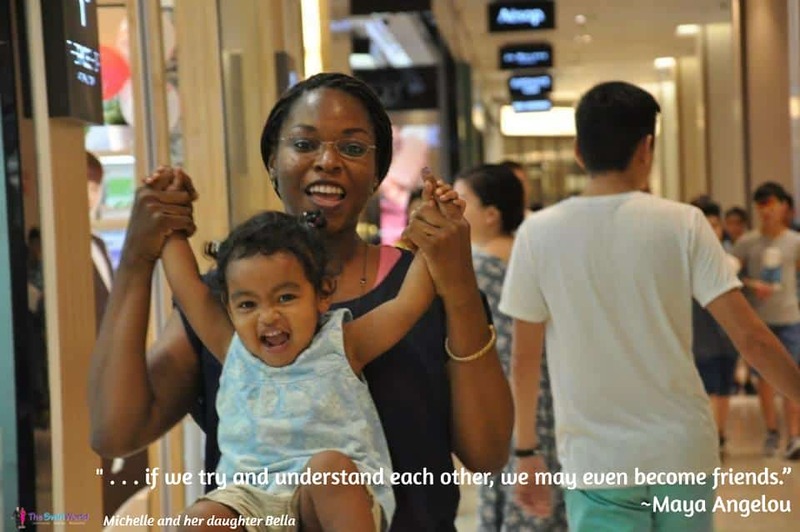 Today’s photo features Michelle and her daughter Bella while in Kuala Lumpur, the capital of Malaysia. Michelle has agreed to share with Swirl Nation more of her life and her travels via photos and blog posts. Join in the Fray: What new friends (or acquaintances) have you made as a result of traveling? It’s not only Thursday, it’s Travel Thursday! If you live in a part of the country where you are yet able to take advantage of warm weather, get up, get out there and enjoy it! Heading to the beach, fishing at the lake, hiking (or biking!) new trails and sitting around campfires are but a few activities we can engage in to get to our happy. Don’t care for the outdoors? Well, there’s always a library, museum or bookstore you can retreat to. 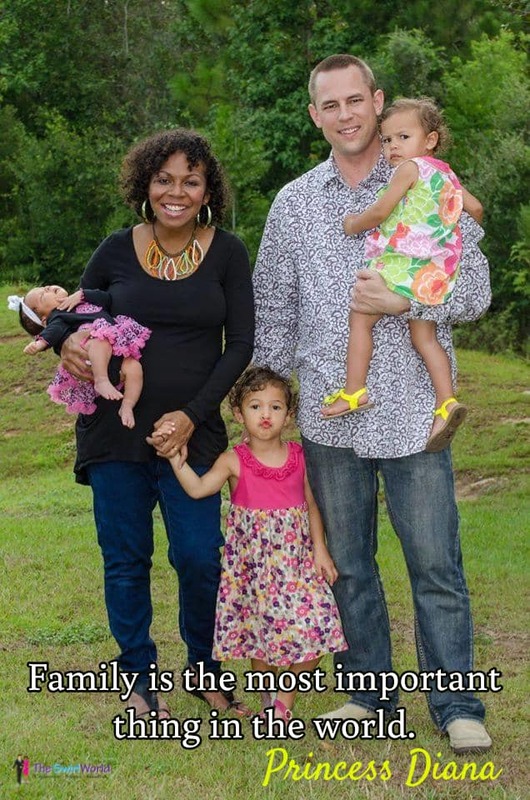 Today’s post features the Harrell family. For them, the beach represents an ideal place for getting in some much-needed family time. 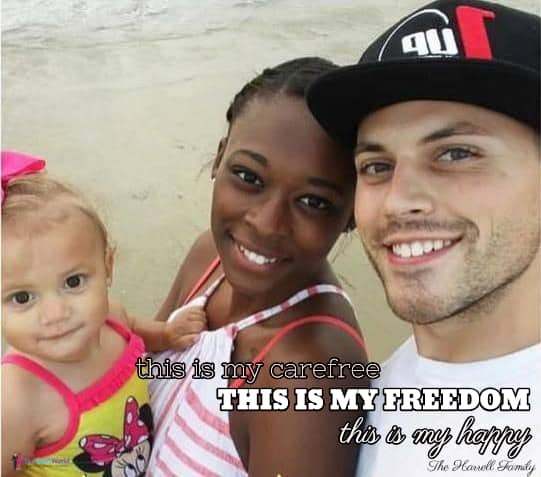 That carefree family time gets them to their happy. Find a place you love, get there, and get to happy! Can you discern the sense of wonder and rapture little Iyona (pronounced eye-yon-ah) is experiencing in this photo? Though I’m planning to catch up on work this weekend, my goal is to deliberately be on the lookout for magic things: the teasing expression on a friend’s face, the inquisitive tilt of the head of my neighbor’s cute little dog or the chatter of the birds taking advantage of my Mother’s feeder. I don’t want my senses dulled by busyness or distractions. I don’t want to miss the magic things. Join in the Fray: What are some “magic things” you don’t want to miss? Copyright ©2015 Michelle Matthews Calloway, ASwirlGirl™, The Swirl World™, The Swirl World Podcast™, The Swirl World Inspiration Daily™, Swirl Nation™, All rights reserved. Photo Copyright ©2013 Kenneth Thomas, used with permission.